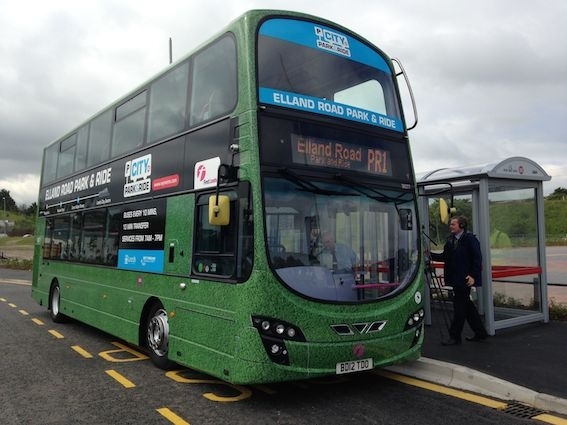 Plans have been published to increase the capacity of the Elland Road Park & Ride scheme from its current 800 cars to 1,350. The expansion would use the land between the football stadium and the M621 motorway. Buses would also use a one way circulation making use of the football bus gate off the Junction 2 rounabout. A consultation event will be held at Hillside Enterprise Centre, Beeston Road on Tuesday 10 July from 5-8pm. Plans for the extension, and for the White Rose rail station, will be on show and officers will be on hand to answer questions about the proposals. Consultation is also underway on plans that would see buses given priority on Hunslet Road and Low Road. The plans are part of Connecting Leeds, the Council led plan to improve transport throughout the city. The end of June saw a series of drop in events and the consultation continues online until 27 July at www.leeds.gov.uk/connectingleeds. The proposals seek to maximise the space and efficiency of the road network and offer enhanced cycling and walking provision as well as improving air quality through reduced congestion. The plans include longer and new bus lanes, smart traffic signals and new junction layouts to help keep buses moving, especially during peak travel times. The road will be narrowed to one lane in each direction for other road users. Doubling bus usage in 10 years from the current 250,000 journeys per day is the target. This will greatly reduce the number of vehicles on the road and ease congestion. We spoke to Cllr Richard Lewis, executive member for regeneration, transport and planning and asked him if the emphasis on buses was about discouraging cars from using the city centre. The Connecting Leeds plan has been developed from the feedback received in the biggest-ever transport conversation held with residents, businesses, stakeholders and visitors in the city which included more than 8,000 people taking part in a survey in 2016. Plans for a new rail station connecting the White Rose Office Park and Shopping Centre were published earlier this week. Funding comes from the £173.5million pot given to Leeds after the Trolleybus project was blocked. Wanting to encourage more people to use the bus. I would be happy to do this if we had a decent service on the Cottingley estate, the sevice provided by First Bus is atrocious. We have 2 buses an hour to Leeds and 2 Buses an hour to Morley that is if they turn up. We have no bus running up to Beeston and no buses going down Dewsbury Rd. 1 Bus an hour to The White Rose Centre, no evening buses to Leeds and Morley I could go on and on about this First Bus who quite simply the worst outfit to run buses in Leeds. The council are also to blame for letting First Bus run a service like this. To add to all this the local Aldi has closed so we have no supermarket to get except going to Morley. So this so called consultation should concentrate on getting a decent bus service. Never mind park and ride. You have to move with the times. Preston has had a park and ride for the last 10 years or more. This council helps you do what is best for you the public. Leeds is a wonderful place, I love it but I need to know I can get back home on a bus after 2300. Also we need more information invite people who go on bus, not 2 Jags by the way. I live in Holbeck always makes l on Holiday, also why not open Brown Lane again?